At last years Prague cannafest I got a pair of Method Seven grow room glasses. The difference they make when you are under harsh hps grow lights is amazing. For the last six months my eyes have been given a rest from harmful UV A/B and UVC rays. If you wear sunglasses in a grow room they will protect you from the A and B rays but can leave you exposed to cataract inducing UVC rays. You get to see your babies grow in clear colors. Praguepot recommends this new technology. Being a half blind great grower is not a health trade-off needed to hone your skills. If you spend an extended amount of time under hps bulbs then do your older self a favor and get a pair !! It is hard to believe what has happened in America. They are the crazy prohibitionists that have finally seen the light. You have to remember that America has been the main protagonist in this international war on cannabis. They have spent billions of tax payers dollars fighting against the spread of pot use. They have failed miserably at this task and have criminalized a vast army of otherwise law-abiding citizens. If you are a puritanical, white Christian in America, it will be with horror that you realize that Colorado has not imploded after the legalization of cannabis. Worse from a prohibitionist’s point of view is the 25% reduction in medical pain killer overdose deaths in states that allow medical marijuana. The drop in crime and increase in taxes all lead a sensible person to conclude, that cannabis is good for society. Cannabis has support from both sides of the American political carnival. Each of the candidates for next years Imperial Emperor elections will have to state their position on cannabis. So far, politicians have tried to laugh off the cannabis question. They say it is not something they are proud of and isn’t something they do now. Obama, to be fair, has been the most honest about pot. He sees it as a vice like tobacco and is also afraid of the damage a large, money hungry corporation might do within the pot industry. It is cool that he has this opinion, he seems to be the only one that has developed his views on marijuana, but that doesn’t really help the legion of poor, black men sitting in jail for cannabis crimes. 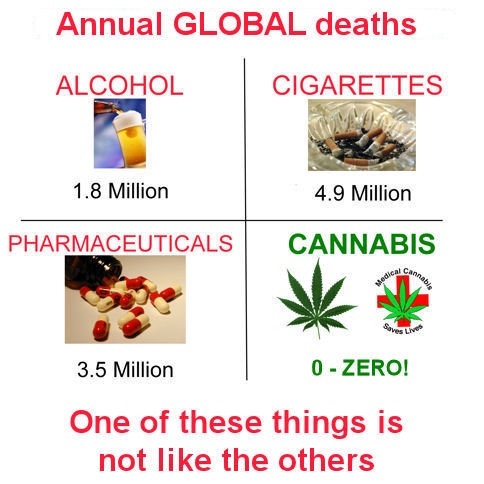 Besides the hypocrisy from the prohibitionists, the politicians are missing one very important point. Cannabis is an amazing medicine for older people. It helps with painful inflammation (arthritis), helps regulate your heath system and even regrows brain cells. They are robbing older people of their health. Pot use reduces the risk of diabetes. Those are good odds in a country that has a very serious diabetes problem. There are hardened, grizzled cannabis activists that have dedicated their lives to legalizing pot. Here at praguepot we love those people. They have given so much to make a real difference in the world. But it wasn’t until the internet came along that their voice and information finally went main stream. Look at what has happened. Within a ten year period, cannabis has gone from a Nancy Reagan nightmare into a normal, legal commodity. The power of the people has very clearly been expressed. With all the prior, hidden research on cannabis being exposed, the prohibitionist bullyboys have been left looking like fools. Cannabis never was a threat. The real threat has always come from out of control concentrations of power. The only antidote for this has been an engaged, active public. The cannabis community has done its job in America. There is so much work left to be done to help heal the planet and society, we might finally be on the right path. Jai Kali Ma. A new scientific study has compared the lethal doses of commonly used drugs. Alcohol goes into the high risk category with a harmful score of <10 and tobacco <100 is placed in the risk group. Cannabis got a score of <10,000. The lower the number the more harmful the substance. Alcohol is Much more dangerous than cannabis but cannabis is the illegal drug? Wouldn’t it be nice to live in a world that has adult politicians running the country rather than a bunch of sociopathic liars. There is no scientific reason to keep cannabis in the illegal category. Click on this sentence to be directed to the scientific extract.